The Danube Promenade in Budapest is a popular esplanade in the bank of the Danube River in the heart of Budapest, between the iconic Chain bridge and the modern Elisabeth bridge. The walkway was created in the mid-nineteenth century, it became a well-liked spot for the aristocrats and artists, celebrities and musicians. We can imagine the old time newsboys, flower girls and chic ladies walking here next to the old buildings. 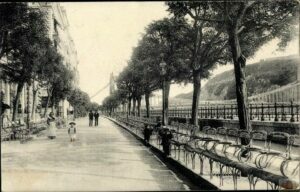 At the Second World War, the Danube Promenade was destroyed and it was reconstructed only in the late 70s. The Promenade, “Duna Korzo” in Hungarian is less bourgeois still a beloved place for everyone who enjoys summer walks and the beautiful sights of both sides, Buda and Pest. The Promenade covers the pedestrian walking area along the Pest side of the Danube from the Elizabeth Bridge to the Chain Bridge. This is where the luxury hotels like Marriott and Intercontinental and Four Seasons are located and we can find dozens of nice terraces, outdoor dining and venues. You can admit the Buda Castle and Fisherman’s Bastion on Buda side, the Gresham Palace, Vigadó Concert Hall, and much more. We recommend you arrive in the afternoon ours to enjoy the sunset and the spectacular evening lights. Close to Vigadó Concert hall, we can find the statue of Sandor Petofi who is one of the most beloved poets of Hungary. He dies in the independence fights in 1948. Nearby, the Little Princess (created by Laszlo Marton) is sitting on the railings with shiny tights. Tourists are placing their hands on her legs, hence the polished look. Girl and her dog is also a well-known statue, you can sit next to her on a bench. She is playing with her dog and the sculpture is showing us this lovely moment. Shoes along the river Danube reminds us of the dark era of the Holocaust (sculptor: Gyula Pauer). The other statues are Attila Jozsef (poet), Mihály Vorosmarthy (poet), Istvan Szechenyi (politician, the greatest Hungarian), Archduke Joseph (Palatine of Hungary), Jozsef Eotvos (writer), and William Shakespeare. 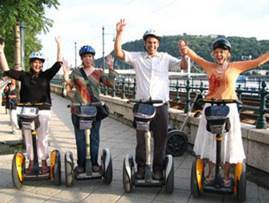 Explore the Danube Promenade and the city centre on 2 wheels, join one of the Segway tours.